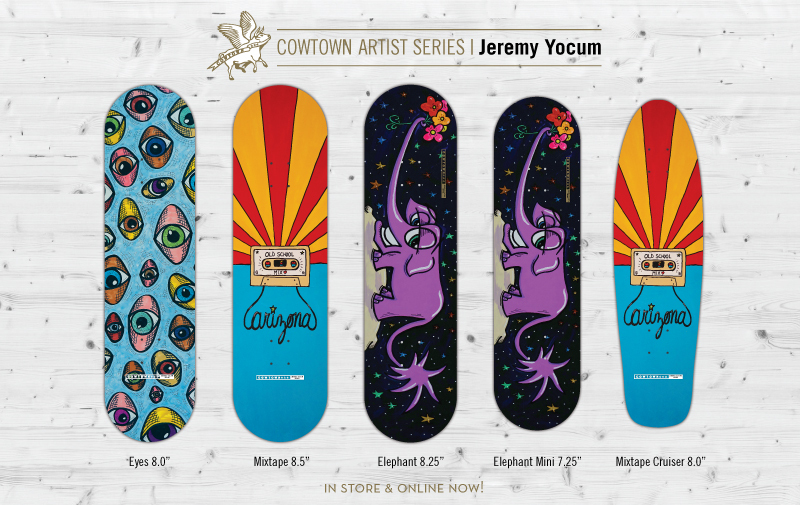 Cowtown is proud to release our latest Artist Series deck collection featuring the art of Jeremy Yocum. Three graphics spread over five different sizes including a mini and cruiser. Jeremy Yocum has always been a fan of pop culture. He grew up in the AZ desert in the 80s skateboarding, listening to punk rock, and watching Saturday morning cartoons. All of these elements have influenced his art. His art is bright, whimsical, fun and at times edgy. Jeremy currently teaches art to high school students in Phoenix and screen-printing to adults in Mesa. He is a print-maker, painter and sculptor that regularly shows his work around the metro Phoenix area in galleries and restaurants.